So when I was a kid, we lived down the block from Metro Goldwyn Mayer Studios. I was too young to know for sure, but I think maybe it was my mom’s idea. She used to tell me all sorts of stories about the movie stars she saw coming in and out of the gates and how she would check every day to see what the weather was like on the huge wooden sky backdrop they would paint with puffy white clouds or beautiful sunsets depending on the movie being shot. On top of the main building was a huge glass sign with the roaring lion logo on it which you could see for miles around. She was so excited about being near that studio, but she could only see the bits of movie making visible over the fence. She never once got to go inside. I feel a little guilty that I did. Of course, MGM isn’t MGM anymore. The studio that gave the world The Wizard of Oz and Singing in the Rain was sold off years ago, the back lot made into condos, the movie collection going to TCM. Nowadays all most people remember is the hotel in Vegas which doesn’t really have much to do with the studio at all except for the yellow brick road that used to run through the casino. What’s left of the original buildings became Sony Pictures and little by little everything that said MGM was removed or replaced. 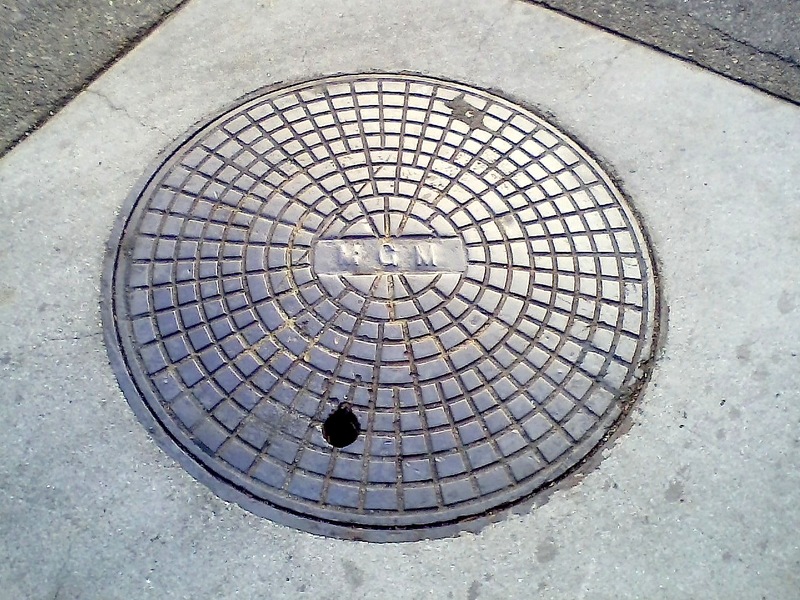 Except for this lone manhole cover. Which isn’t much to look at, but think about it. Maybe Dorothy stepped across it on her way to Oz or Gene Kelly practiced a dance step or two while waiting between takes. Or maybe, if it is old enough, Louis B. Mayer himself stepped on this humble metal circle. And now I’ve stepped there too, just for a moment, just long enough to feel the magic. Not just for myself, but for my mom. I think she would have been thrilled.